You haven’t really experienced PC gaming if you’ve been playing on a laptop instead of a desktop. You’ve enjoyed the convenience of taking your games anywhere, but you’ve sacrificed playability for mobility. Your games are rarely pretty. You run things on mid-to-low settings. The newest games struggle. But with Nvidia’s latest new line of mobile video cards based on the Pascal chip architecture, that’s all going to change. Nvidia just closed the gap between mobile and desktop PC gamers, and made VR accessible to a much larger audience. Nvidia has made some impressive strides with video cards this past year. Previously, laptop video cards—the M series— were significantly slower than their desktop big brothers. It was the price you paid for mobility. A 980M was never as fast as a 980. That changed last fall when Nvidia managed to pack the performance of a full-sized card into a mobile one. The 980 for mobile devices (not to be confused with the 980M) was a power hungry monster that couldn’t run on your laptop’s battery, but it was fast, and it was a proof of a very cool concept—Nvidia could shrink its best cards down into laptops without sacrificing performance. Until the confusingly named 980 for mobile devices, the mobile cards always had an M latched onto the end to denote the sacrifice in performance their use entailed. Yet now Nvidia says the new mobile series (1060, 1070, and 1080) is so good that the M is no longer necessary. Performance differences between a Nvidia 1070 card in your laptop should be virtually identical to that in your desktop. They should both deliver similar frames per second, which means things on screen move smoothly and naturally. Higher numbers are better, with 60 FPS being ideal for most gamers, and 30 being merely acceptable. Using Mike Fahey’s excellent benchmarks for his review of the 1070 desktop card, I was able to draw a nice comparison. Mike benchmarked the desktop 1070 at 4K so I plugged the MSI GT62VR with a mobile 1070 card into my 4K TV. It managed a respectable 30 frames per second on Witcher 3 at the highest settings—about the same framerate as your favorite TV shows and movies. Yet it also seemed capped. This is likely due to older drivers and I’ll be updating with new numbers as soon as Nvidia gets new drivers in my hand. The desktop 1070 by comparison managed a very adequate 44 FPS. Both cards had no issue hitting 60 FPS at a resolution of 1080p, which is great for the laptop as the MSI GT62VR uses a 1080p panel with a 60Hz refresh rate. Better frames per second would be wasted on it. By comparison, the previous generation 970M on 1080p at the highest settings hits just 33 FPS. That’s half of what the new generation is capable of. They both performed equally well on Rise of the Tomb Raider too. With the graphics set to their highest settings on 1080p, both handily hit 60 FPS and trounced the 970M’s lackluster 41 FPS. But when I went back to 4K, the laptop 1070 managed a just barely acceptable 30 FPS again. The desktop version faired only a little better: 39FPS. So what does all this impressive speed mean? It means the 1070 mobile card is just as capable as the desktop card at handling VR. The previous 900M series was incredibly wretched at VR. I once spent a long and nauseating afternoon getting an Oculus Rift up and running on a laptop only to find that the framerate was so bad I wanted to throw up. Framerate is critical for VR. If the images in front of your eyeballs can’t refresh fast enough then your brain will start telling you what you’re looking at is fake, nausea will set in and you’ll just want to lie on the floor in a ball and moan for twenty minutes—possibly while begging coworkers to fetch you a cold compress or something fizzy to drink. 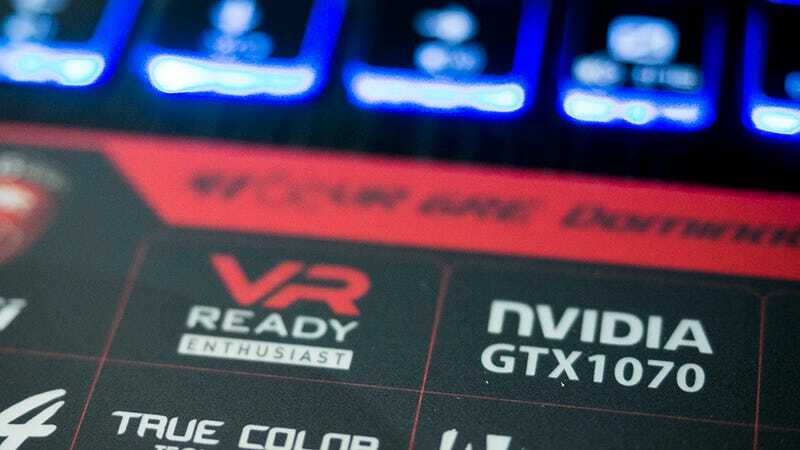 VR-capable video cards in laptops doesn’t just mean more people can use VR, it also means more people can develop for VR, which means we can get more VR content into a currently very anemic field. And the price for entry is no more than you would normally spend on a laptop with discrete graphics. MSI has one for as cheap as $1600. So while Nvidia’s feat of engineering is impressive, the real magic will be the content produced with the card. Virtual reality just got a whole lot more accessible to the masses.